I was hoping to do what I did with Steve the News on the March octopus and locate the actual source for the footage, but after much consideration I’m finally decided that there’s no mystery to solve and the scene in question is all original footage — I’m not 100% sure, but let me talk you through my thinking and we’ll see who agrees. The topic was first discussed on this site here, with Dan North intrepidly searching for the mythic stock shot after I mentioned it, not at that point questioning its veracity. We pick up sinister manservant Paul Stewart as he drifts past through the well-lubricated revelers — several black shapes flit past in the murk of night — we move in on the Kane tent, and dissolve to a blazing row between the Charles Foster Kanes. As far as I can see, the allegation that this sequence incorporates SON OF KONG footage is entirely down to the black flying things. They’re clearly not real — what they are is cel animation, “on twos” — photographed two frames at a time, which makes them seem rather jerky compared to the live action foreground: like stretching out 12 frames per second to 24. I’m indebted to William Randall William Cook, for the technical analysis throughout this piece. Randy is no stranger to animation… or confusion. 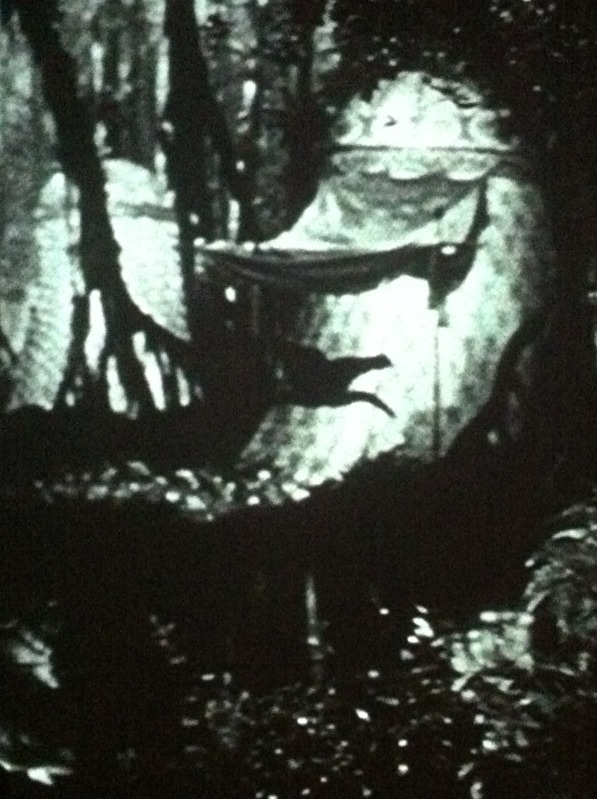 Blow-Up: a KANE bird (centre) photographed off the new BluRay in close-up. Now, SON OF KONG famously relies on stop motion miniatures rather than cel animation, but at the top of this post you can see some black silhouette birds which do appear in it. They appear to be rotoscoped — matte outlines taken from real birds in real footage. Whoever inserted them into the film (I guess optical wiz Linwood Dunn) apparently couldn’t be bothered pasting in the bird footage, and just left the dark shapes — maybe because the effect was more atmospheric. 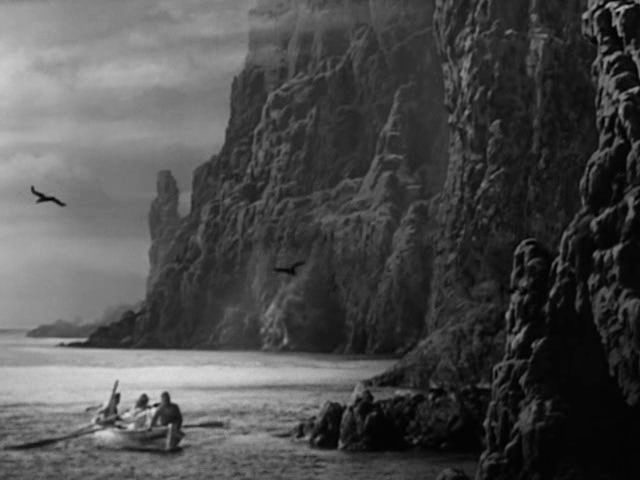 Skull Island, home of the black gulls. So there’s a stylistic connection between KONG and KANE, but bear in mind these birds are NOT produced by the exact same technique. The KONG birds are “on ones” and they’re rotoscoped off of real gulls, whereas the KANE birds are simply animated, and using half as many images per second. 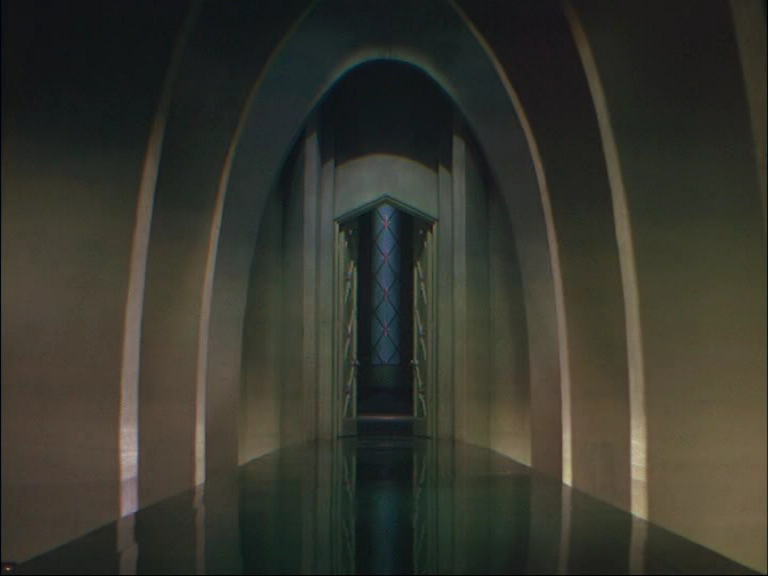 Also, the glass-painted jungles of both films are by Mario Larrinaga, so a the style is understandably similar. But SON OF KONG contains no nocturnal jungle scenes, and we can’t suppose there were deleted scenes that KANE might have pilfered, because SON OF was a very quickly-produced rip-off sequel. If there was anything left on the cutting room floor, it wouldn’t be expensively produced special effects shots, it’d be Robert Armstrong yackin’. The low-flying beasties are the only example of cel animation discernible in KANE, so the assumptions have been (1) they’re not specially shot, they must be from elsewhere (2) they’re kind of distracting, they must be something Welles was forced to accept for budgetary reasons (3) they’re pterodactyls from SON OF KONG. I suspect SON gets nominated rather than the better-known KING because it’s easier to imagine some bit of unfamiliar footage existing in that comparatively little-seen film. Randy is convinced that the animated flappers are storks, or similar exotic birds and therefore an intended addition to the scene. I wondered if the birds had been added in order to transform an African backdrop into a Floridian one. But lets look at — and think about — that background. Or indeed, those backgrounds. Randy points out that what we’re seeing is specially-shot KANE foreground action (that’s Paul Stewart, after all) in front of TWO rear-projection screens, separated by a big tent. The second screen is really big, probably the one Fay Wray cowered in front of in KING KONG, so the screen may be from the 1933 ape epic even if the images projected on it aren’t. Now, we can clearly see that the projected images are matte paintings, except for the animated birds and the rippling water. What we can also see is that they contain tents — decorative tents matching the ones in the live-action foreground, and certainly suggestive of a party rather than a jungle expedition. So dismiss any idea that this is material patched in from a TARZAN movie. Wrong studio, anyway. Randy is certain the paintings are the work of Mario Larrinaga, employed elsewhere on KANE’s numerous mattes, and also responsible for most of Skull Island’s rotting foliage. So the feeling that the backgrounds are reminiscent of KONG is grounded in truth — like most myths. 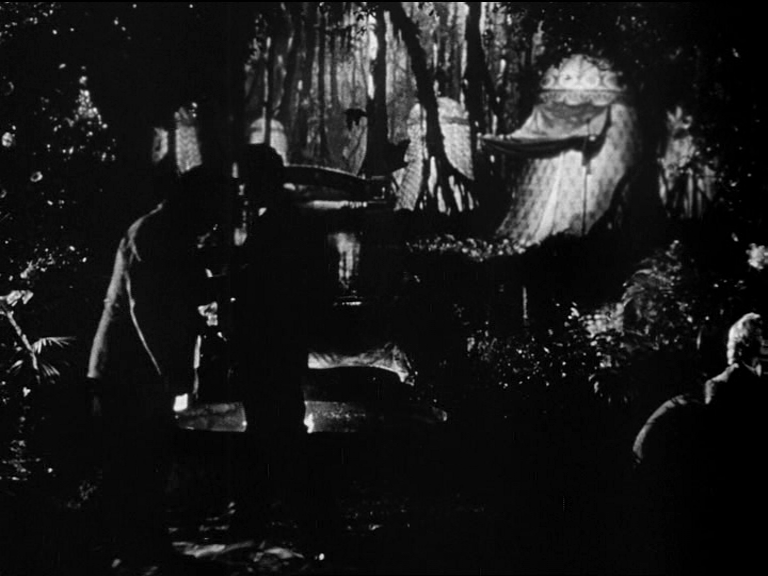 So, given that the foreground is pure KANE-Welles-Toland footage, and the tents match, and the whole scene strongly suggests a very specific milieu, a rich man’s party in the Everglades, and even the animated birds fit that hypothesis, the only way to incorporate SON OF KONG material into this scene would be to propose that matte paintings of jungle scenes from a KONG picture had been overpainted with tents in order to compliment this sequence. So there’s no possible question of KANE recycling stock footage from KONG, at most we’re talking about the partial re-use of overpainted mattes… and that doesn’t strike me as any more plausible than the suggestion that they’re original mattes, unless somebody can identify the shots in KONG JNR that those trees are in, which so far nobody has. This shot is a cutaway interpolated into the tent argument. 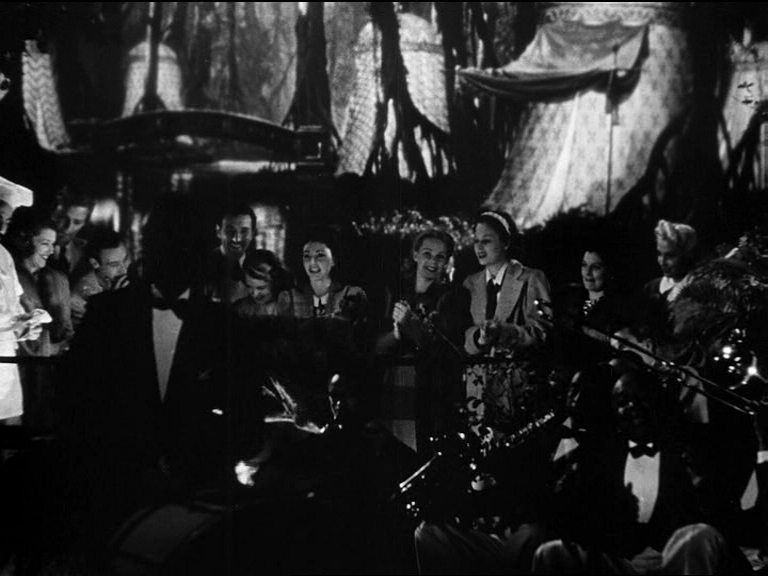 But the following scene with the Kanes in a tent is so simple and cramped, the sprawling exterior footage is quite necessary to make the sequence feel like it’s a real outing (albeit a 1941 studio picture’s version of an outing). And as every magician knows, one way to fool the audience is to put so much work into a trick that the audience dismisses the most obvious explanation (“Well, he can’t have memorized the position of every card in the deck!”). And Welles was a magician. That’s what it comes down to, all this painstaking rumination and nerdiness — a single critical insight, that Welles was quite capable of staging an elaborate master shot involving a crowd of extras, two rear-projected matte paintings, one incorporating live action water and the other with animated birds — just as scene-setting.